The 4R Nutrient Stewardship Certification Program has announced that the Mid-Wood, Inc. Tontogany facility has been added to its growing list of nutrient service providers to achieve certified status. The voluntary certification program, now in its third year, is a concentrated effort by the agriculture industry to significantly reduce and prevent applied nutrients from running off fields, which has contributed to water quality issues in Lake Erie and other waterways across Ohio. The Mid-Wood location in Tontogany, Ohio has been part of the Mid-Wood cooperative since 1992 and, in conjunction with another Mid-Wood location, serves as a full-service agronomy location. The current on-site employees have more than 80 years of combined experience in agricultural retail and includes two certified crop advisers. “With the 4R strategy fully in place, we carry out our primary goals of implementing best management practices and outstanding service for our agronomy customers,” said Miller. 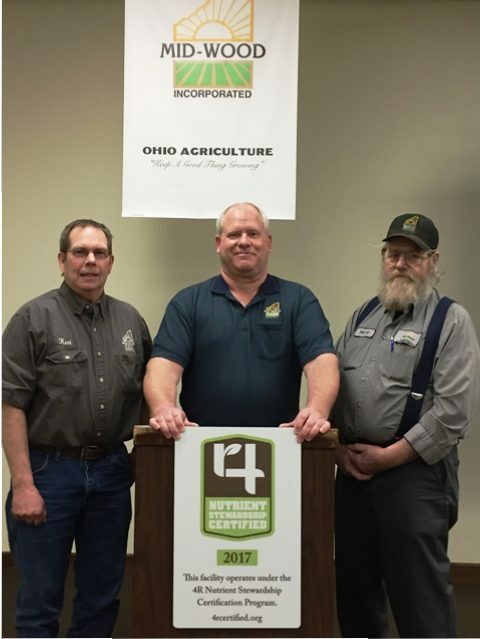 Approximately 2.8 million acres and more than 5,000 grower customers are serviced by the 38 facilities in Ohio, Michigan and Indiana that have earned 4R Nutrient Stewardship Certification. “The Nutrient Stewardship Council is proud of Mid-Wood Tontogany’s efforts in earning certification in this voluntary program, ” said Carrie-Vollmer Sanders, Nutrient Stewardship Council chairwoman.